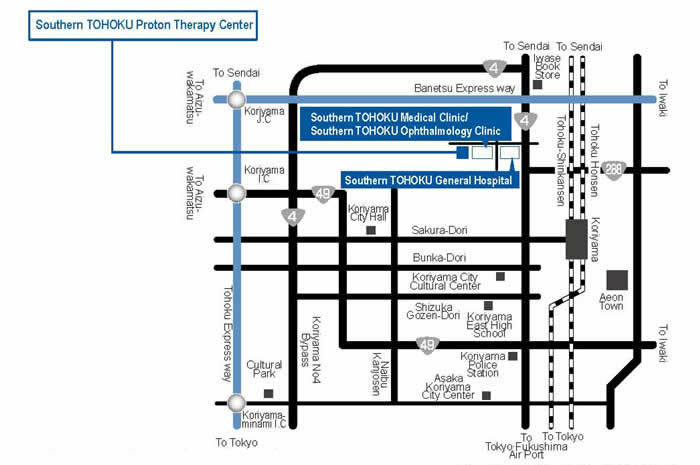 Southern TOHOKU Proton Therapy Center is established next to Southern TOHOKU Ophthalmology Clinic and Southern TOHOKU Medical Clinic, which is a high level diagnostic treatment center, and Southern TOHOKU General Hospital, which is a regional partner hospital for cancer treatment / regional hospital for medical support. These facilities have joined hands to provide comprehensive treatment. This allows our patients to receive proper treatment, based upon medical reasoning, on not only proton therapy but also on surgery therapy, chemotherapy, and radiation therapy, which are existing therapies for cancer. We have partnered with Hyogo Ion Beam Medical Center on proton therapy. In addition, we receive support on areas including,medical physicists & radiologists training,ion beam treatment specialists training,and nurse training with the cooperation from Hyogo Ion Beam Medical Center. Southern TOHOKU General Hospital is a general hospital with 32 medical practices and 430 beds. It accepts more than 4,000 ambulances each year as a Japanese secondary emergency hospital, and more than 5,000 surgical operations are performed each year. There are many medical examination systems on the premises, including mammography systems, 64-channel multi-slice CT, 1.5 Tesla MRI, and radiation therapy systems including Lineac (linear accelerator) and intracavitary irradiation system. In 2005, the north wing annex was built with 160 rooms, and the hospital offers a commodious hospitalization environment. 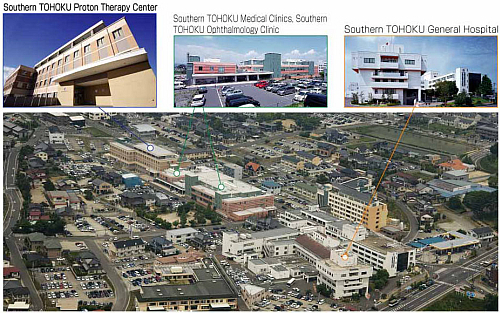 Southern TOHOKU Medical Clinic and Southern TOHOKU Ophthalmology Clinic were opened in 2004, to migrate the outpatient functions of Southern TOHOKU Research Institute for Neuroscience. There are 28 medical practices, and these are high performance clinics with advanced and innovative medical systems, including 2 PET-CT systems, 3 PET cameras, gamma knife, 3 Tesla MRI, 16-channel multi-slice CT, and high frequency heater for hyperthermia. Moreover, Southern TOHOKU Ophthalmology Clinic is also situated on the premises of this same building, and many types of opthalmological diseases are treated.